Today was Hollywood day. I never thought I would say these words, but I actually chose to pass up going to Disneyland. In all fairness, it was only because our trip was so tight and we really only had time for one or the other. I’d done Disneyland before, a couple times… but I had never been to Hollywood before. Stacy and Nicola took the girls to Disneyland – they were so excited! – and Mom and I decided to take inspiration from Kristin and Justine (www.wonderandwanderlust.wordpress.com) and try out a Hop-On Hop-Off tour of the area. For those of you that have not heard of these before, these tours are awesome! They have a bunch of buses doing a loop throughout the day, and when you buy a ticket, you can hop off at any stop you like, walk around and explore, then catch another bus whenever you want (they generally run at half-hour intervals). This LA tour was a little ambitious for us as it actually is such a large area that it has 4 separate routes and a few locations where the loops crossover and you can move on to a different area, but I think we did a pretty good job of seeing everything we wanted to see. The tour we were on had an electronic tour guide. We learned a ton of cool facts about the area because of this. On that note, one such fact is as follows. The man who designed the city of Santa Monica years ago saved the best piece of land for himself, on which he built a mansion that he eventually christened “Miramar”. Now, years later, this building has become the Fairmont Miramar Hotel. 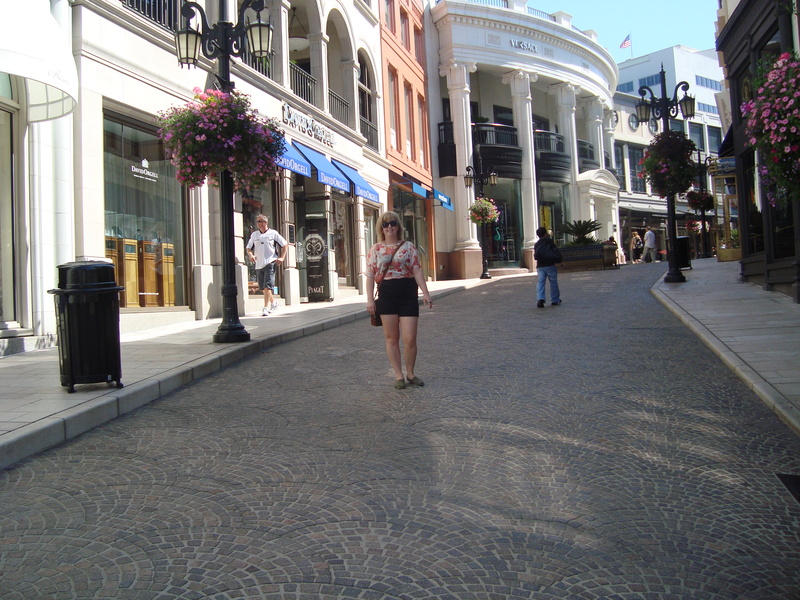 On Rodeo Drive, we also saw what I believe is the most exclusive store in the world. Apparently you need to book an appointment to even enter this store. It was pretty intimidating for us to walk into any stores along this iconic street, but it was a very cool experience to be there. After spending some time in this area, we hopped back onto the bus and rode the tour through a bunch of different and very interesting neighbourhoods. It was really neat, throughout the day, to see how close together all these important pop culture locations are to one another. For example, in the span of a day, we were able to drive by locations like Shirley Temple’s house, the house Marilyn Monroe died in, OJ Simpson’s house, the El Pollo Loco Restaurant that Brad Pitt had the job of dancing outside in a chicken costume before he became famous, and many more interesting places, including the iconic Hollywood sign. 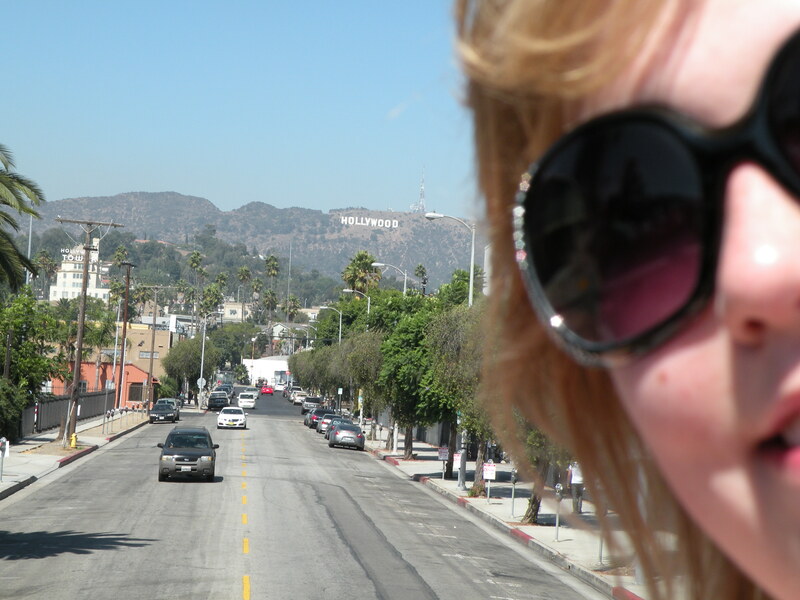 Me (sort of) and the Hollywood sign. We were a little close on the bus, so pictures were tough, but I guess this at least proves I was actually there! 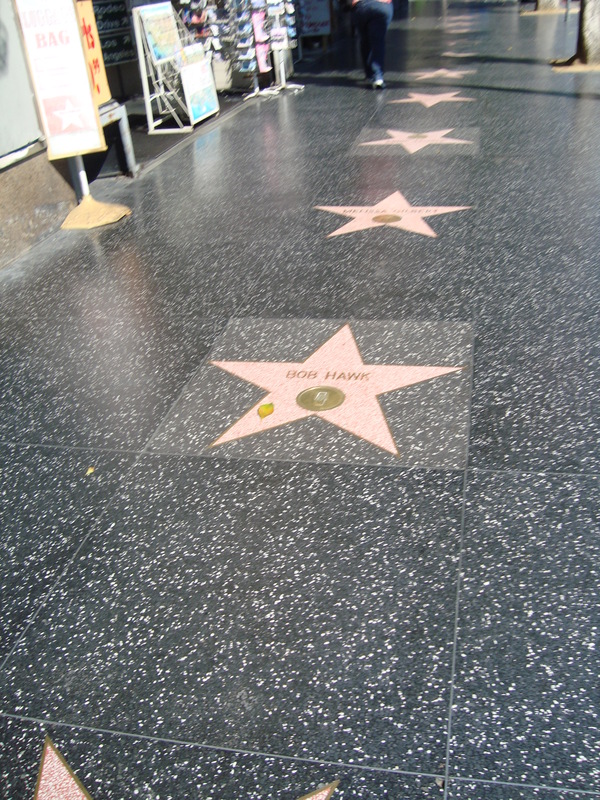 The next place we hopped off at was Hollywood Boulevard. We walked the Walk of Fame toward the world famous Grauman Chinese Theatre. It was hot, and it was a really neat atmosphere to wander around in. 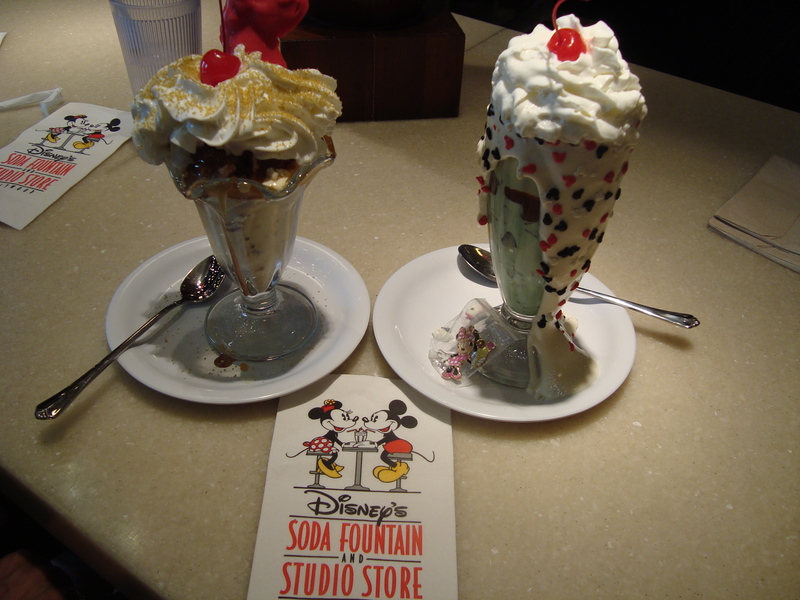 We bought a few souvenirs, and decided to stop for refreshments at the Disney Soda Fountain and Studio Store. It was nice and cool inside, and we got the most delicious ice cream treats! Mmmm… mine was the one on the right. Mom got the Simba special on the left! 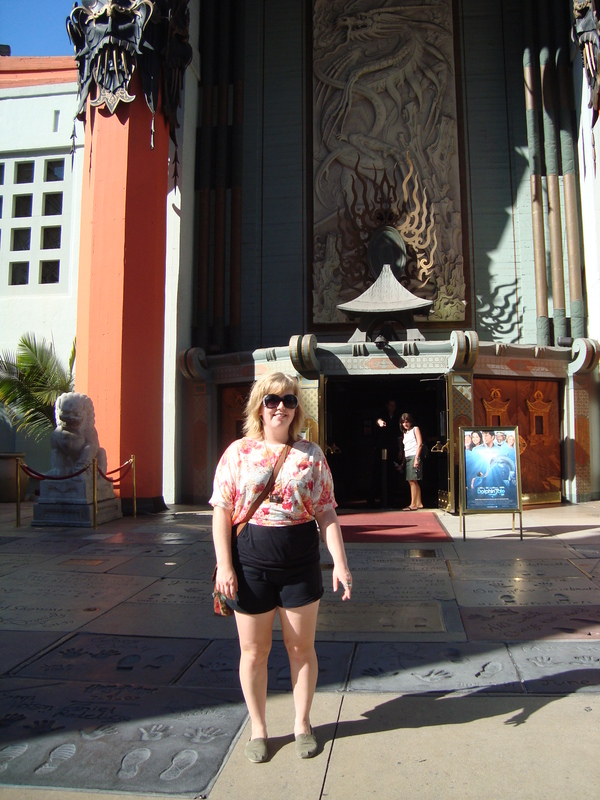 After that, we crossed the street to see Grauman’s Chinese Theatre. 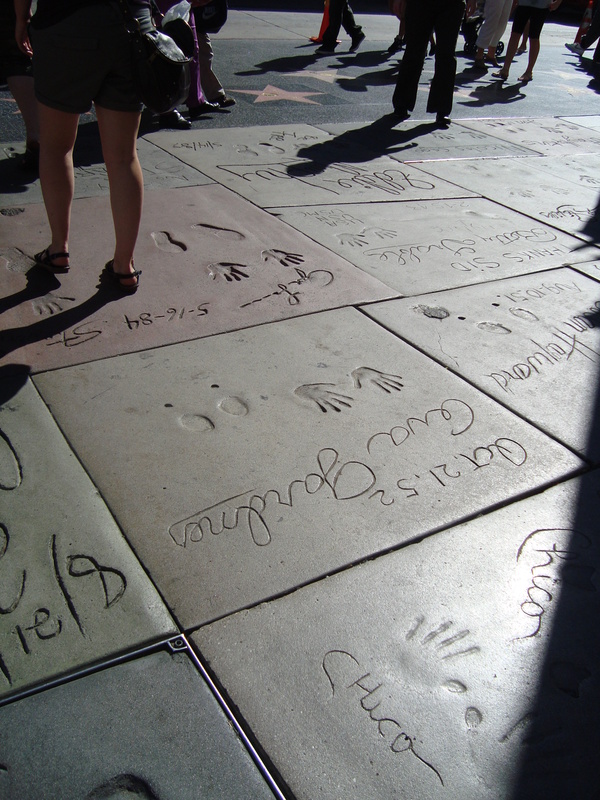 The ground outside the theatre is covered in autographs, footprints, and handprints from various celebrities, drawn into the cement, some of them dating back almost 100 years! As our trusty electronic tour guide explained on the bus, when Grauman was building the theatre, he went to see it one day and accidentally stepped in the cement, leaving his footprints. When his contractor saw that, he said “If I don’t get rid of those footprints now, they will be there forever”. It seems that Grauman liked the idea of forever, and his iconic and unique theatre was born. 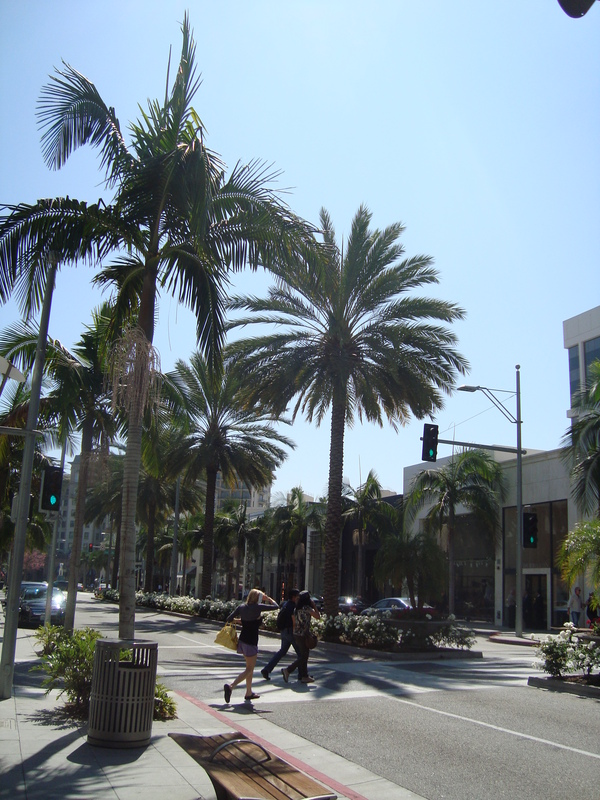 Once we were done looking at the theatre, we hopped back onto the bus to make our way back to Santa Monica. We still had almost two hours of bus riding to do, and we needed to make it back to the Miramar in time to catch our car to the Fairmont Newport Beach to meet up with the rest of our group there. On the way back, we were told many more interesting stories and saw many interesting sights. Santa Monica has been used for filming many movies, though the beach is not used as much today due to the high winds. Our guide told us a story about a film director many years ago that wanted to use Santa Monica as a film site for a piece set on the East coast. As you know, the sun sets into the Pacific Ocean, but on the East coast, it would rise in the Atlantic. This director decided that they would simply shoot the sunset, and play it backwards to suit their needs. They did this, and played it back as a beautiful sunrise… complete with seagulls flying backwards. The tour ended and we went back to meet our car at the Miramar. We had a nice drive out to Newport Beach, and I was able to meet up with my good friend Mike Taylor (@BasherAD) for dinner! It was lovely to catch up with him and his new California life. I did see the girls for a few minutes before meeting Mike, and they were very excited to tell me all about their day at Disneyland. My favourite thing about today was walking the Walk of Fame on Hollywood Blvd., and learning about the history behind this interesting area.